In just one week’s time, you can shop for a huge range of presents, decorations, food and drink that you won't find on the high street. Visitors will be pleased to know that entrance is free and there is free car parking, so you won't have an empty wallet before you start shopping. Because of the fabulous stalls, we can't promise wallets will be in the same state when you've finished visiting the marquees and shops. 90+ independent traders offering presents, decorations, food & drink. You'll find presents for everyone on your Christmas present list and can make your house look amazing too! No longer do you need to head into mainland Europe to enjoy a proper Christmas market, because Deepdale Christmas Market brings the ambience of a European market to the North Norfolk Coast. Throughout the weekend there will be entertainment, a huge collection of local producers and plenty of festive cheer. Take in the lovely smells of mulled wine and spiced cider, enjoy the tastes of hog roast, bbq café food, duck wraps and fresh pizza. Brewers, photographers, toy makers, food producers, jewellers, glass makers, potters, artists, crafters, upcyclers, blacksmiths, knitters, distillers, charities, woodturners and many other artisans will be gathering for 2 days of festive cheer on Saturday 6th & Sunday 7th December. 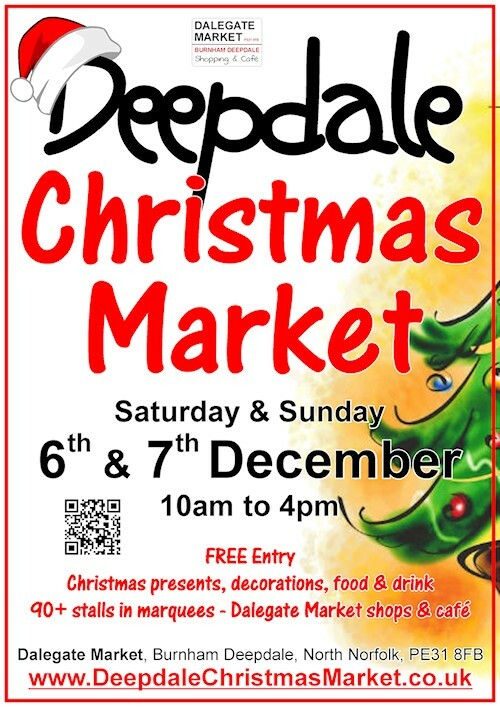 Deepdale Christmas Market is held at Dalegate Market in Burnham Deepdale on the beautiful North Norfolk Coast, approximately half way between Hunstanton and Wells-next-the-Sea. Driving is easy, just follow the AA signs, Dalegate Market is on the A149 coast road. Alternative travel is also very easy, with the Coasthopper bus service stopping right outside the market. Cyclists and walkers and most welcome throughout the weekend.